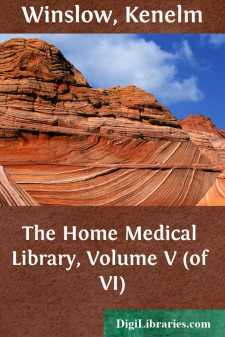 The character and scope of this volume render it a most useful book for the home maker. The question of sanitation is one that closely affects the life of each individual, and many of its aspects are treated here in a lucid and comprehensive manner. Designed for wide distribution, these articles have been written to meet the needs of the dweller in the more densely populated communities, as well as those living in the less thickly settled portion of the country. In large cities the water supply is a problem that is cared for by regularly constituted sanitary authorities. Pure water is a vital necessity, but the inhabitant of a city has no need to personally concern himself with the source of supply. In the country, however, the home builder must often decide the matter for himself, and it is the aim of this book to give him the needed directions for avoiding many errors and pitfalls that abound in this direction. House construction, with its intricate problems, is also a more serious matter for the country dweller than for his city brother. In the matter of food supply, the inhabitant of a country district is more fortunate. Fresh vegetables and dairy products are much more easily obtained, and their freshness and purity more dependable. The article on water supply by Mr. Gerhard is authoritative, written, as it is, by a most eminent sanitarian. The publishers are to be congratulated upon the following valuable contribution to the same subject as regards the use of copper sulphate and the concise presentation of plans for mosquito extermination, while the extended work of Dr. Price and Dr. Baker's "Food Adulteration" are much to be commended. The two latter have been connected with the Department of Health of New York City, and have the advantage of experience in an organization which gives to the citizens of New York the protection to health that the wise use of science, knowledge, and money afford. I trust that the notes I have added in the light of recent practice of the New York City Department of Health may make this material of the utmost practical value to the householder of to-day. Through this Department of Health, New York City spent, during 1905, over $1,500,000, and for 1906 it has appropriated over $1,800,000. This vast sum of money is used for the sole purpose of safeguarding its citizens from disease. Sanitation in its varied branches is pursued as an almost exact science, and the efforts of trained minds are constantly employed in combating disease and promoting sanitation. The cities care for their own, but the greater number of the inhabitants of this country must rely upon their individual efforts. Therefore, any dissemination of knowledge regarding sanitation is most worthy. This book has a useful mission. It is pregnant with helpful suggestions, and I most heartily commend its purpose and its contents. Thomas Darlington,President of the Board of Health.